When people normally talk coffee makers, they talk about brewers, espresso machines and pod coffees. It’s only after a few years that most people come to know about pour over coffee. If you think you’re in that state now, it means you have had enough coffee of a lifetime. 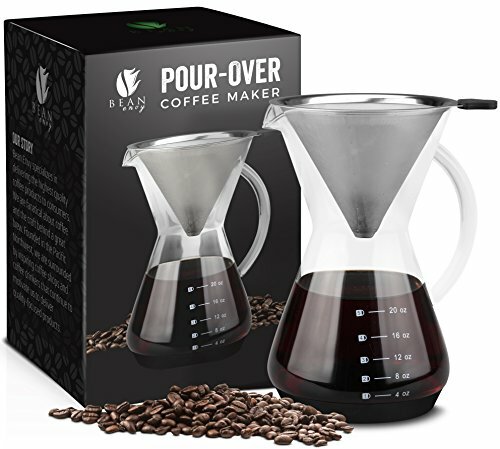 Pour over coffee makers offer the best control over the brewing process. This is completely unlike the quick-and-easy Keurig ones. You’d also understand why it’s important to have the perfect mixture of water, ground coffee, milk and sugar in the cup. Keep the personal preferences aside, you will still need one of the perfect pour over coffee makers if you want the best cup of coffee. In this article, we have listed some of the best pour over coffee makers in town. You can get any one of them — well, as per your needs — for making the best cup, you know. Pro Tip: While making a cup of pour over coffee, ground coffee is the best trump-card you have. So, before you get one of the best brewers, make sure you have an effective coffee grinder with you. This affordable coffee dripper offers one of the best things you need while brewing — control. Keeping track of the water temperature and the amount coffee is an easy task with this brewer at your disposal. We’d use the ceramic version of the product, due to the temperature retention, but your choices may vary. Designed and made in Japan, Hario V60 Ceramic Coffee Dripper prioritizes the ultimate control, as per our experience. The perfect cup of coffee was a dream until we got our hands on this product. You have an option to choose other finishes like Metal and Plastic too. According to people who have been using it for months, this product is quite durable as well. You wouldn’t have to worry about cleaning issues either. Thanks to the sleek design, it feels really easy to clean it up. So, if you are looking for the best level of customization while brewing, this is the go-to. Hario V60 Ceramic Coffee Dripper is an amazing choice if you need the best, customizable coffee on every single day. Despite the affordable price tag, this dripper offers the best level of control while brewing. There are times when you need something more premium than a ceramic pour over coffee dripper. In that case, Kalita Wave 185 Drippers would be our recommendation. Built with stainless steel, it comes with the patented ‘Wave’ Filter, which enhances the coffee extraction process. This product has not compromised the overall usability either. Instead, the Wave filter and the three-hole system would change the way you brew coffee. Of course, you may need some time to get used to this style, but the learning curve is worth it — if you ask me. People seem to love this pour over coffee maker for the overall easiness of brewing. We were able to get an awesome cup in a shorter time period, thanks to the ease of control. It’s quite a time-saving product for any person who wants a cup before rushing to the office. 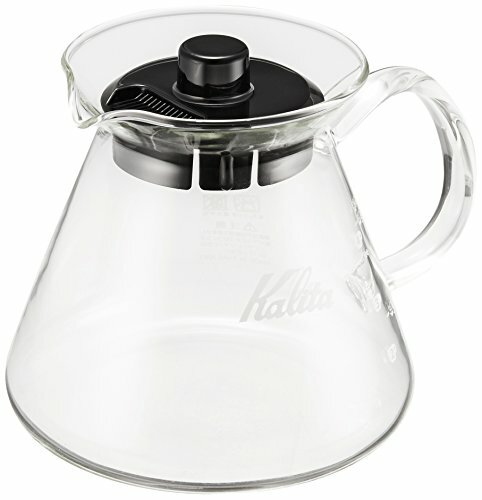 As said, Kalita Wave 185 Drippers is our recommendation if you need premium quality and control over your pour over coffee. The extra money you spend is justified by the performance. Above, we talked about a few drippers, but this one is different. 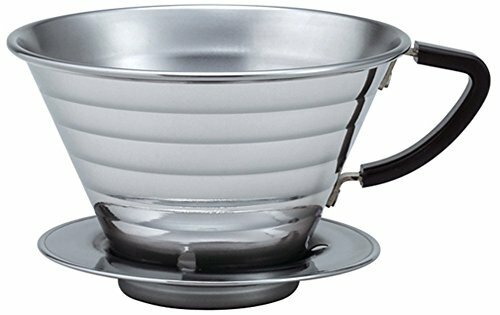 As the name says, Bodum Pour Over Coffee Maker with Permanent Filter is a complete system for making pour over coffee. It comes with a permanent stainless-steel filter, which is way better than paper filters. The biggest advantage we found is that the aroma of the ground coffee isn’t lost. You do not have to worry about mixing the paper-tastes either. The whole brewing process is incredibly easy as well. Once you have added the fresh-ground coffee, all it takes is the right amount of water. The package also comes with a borosilicate carafe, with a maximum capacity of 34 oz. It’s a premium thing that we’d loved seeing with the pitcher. As you can see, the serving capacity is very high. As far as cleaning is concerned, the product is dishwasher-safe as well. 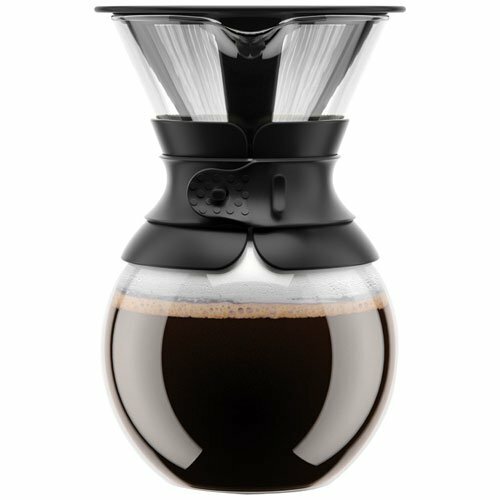 Bodum Pour Over Coffee Maker with Permanent Filter is the perfect choice if you want to make lots of coffee with minimal effort and almost-perfect taste. This pour over coffee dripper is for those who don’t like paper filters. Bartelli Paperless Pour Over Coffee Dripper comes with a permanent stainless-steel filter, which works great. There are multiple holes at the bottom to prevent an over-sour coffee. What we love most about this dripper is that it manages to blend well with the whole taste. You will always have a cup of coffee that tastes great, even if you put a lot of ground coffee inside. Unlike paper filters, this stainless-steel filter won’t absorb essential oils from the ground coffee beans. Most users love this dripper for its compatibility and ease of cleaning. By not using paper filters, you’re doing something great for the environment as well. At the end of the day, you would not regret a single drop of coffee that’s made out of this dripper. Are you looking for a pour over coffee maker that looks as cool as it brews coffee? Look no further than the Osaka Pour-Over Drip Brewer. It, being a complete package, comes with a borosilicate-glass carafe and one stainless-steel filter. You would not only be able to brew coffee without replacing paper filters but you also can get the coffee to a well-built carafe. As far as serving goes, it can hold up to six cups of coffee, which is great. We also found that the glass carafe is really resistant to thermal shocks. We found it really easy to brew coffee using this product, especially with some really hot water. The padding on the side makes it really easy to hold the brewer even when we are pouring hot water. For someone who’s a seasoned coffee maker, this is a great gear. 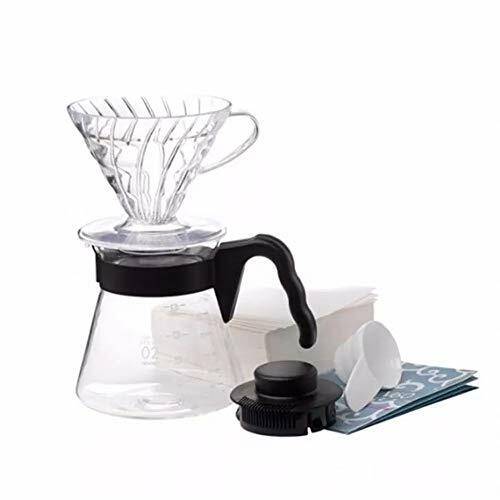 With the stainless steel filter, the glass carafe and the heat resistant design, Osaka Pour-Over Drip Brewer is surely the best pour over coffee maker in town. As a coffee enthusiast, you often reach a stage where you don’t care about looks and finishes. On the other hand, all you need is a functional and affordable dripper. 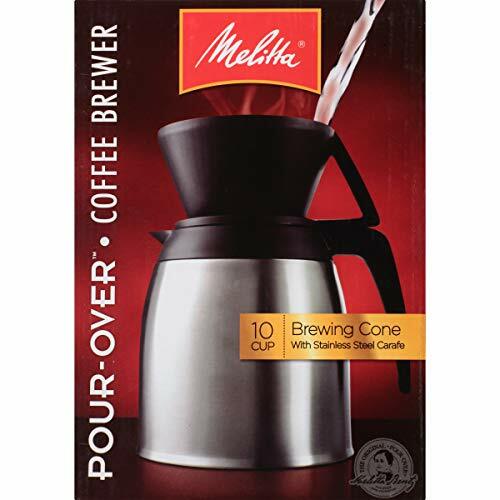 Melitta Ready Set Joe Single Cup Coffee Brewer is the choice if you find yourself in that position. There isn’t anything fancy about this pour over coffee dripper. You have a construction that helps you pour the right amount of water after you have placed the paper filter. One thing we love is that it fits with almost every cup and carafe out there. It’s a product that even college students can buy and use. Of course, cleaning has also been taken care of. 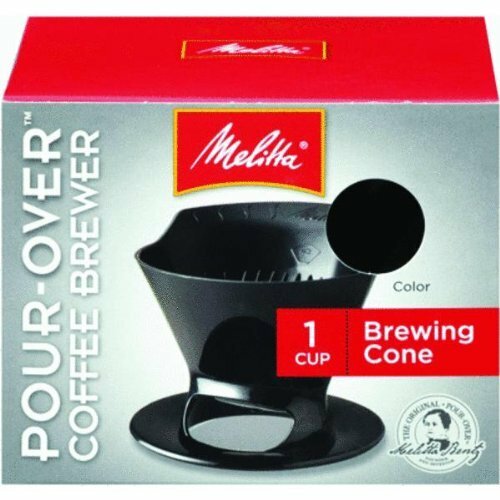 It gets the job done in no time Also, Melitta Ready Set Joe Single Cup Coffee Brewer is dishwasher safe. In fact, you won’t even mind getting a few of these. This coffee dripper is the perfect choice if you need the cheapest cup of coffee. For the money you’re paying, it offers standard durability and functionality. Here’s another great pour over coffee maker to end the list. Bean Envy Pour Over Coffee Maker comes with a permanent stainless steel filter, 20 oz. borosilicate glass carafe and superior quality. No matter how much coffee you are brewing, this maker doesn’t compromise control. Compared to other products we have covered, Bean Envy Pour Over Coffee Maker is a bit expensive. We’d not mind paying a bit more, considering the smacking quality here. Both the filter and the carafe have been designed using the best materials in town. Unlike some of the products in a market, this maker becomes a great addition to your kitchen. As you see, it can help you brew some amazing coffee and serve it well. Because the whole system is made of either glass or stainless steel, there was no loss of taste/aroma either. If you don’t mind spending a bit more for something premium, Bean Envy Pour Over Coffee Maker is the best choice in town. It’s a perfect blend of build quality, control and unparalleled taste. So, these are some of the best pour over coffee makers you can buy in 2019. And, if you have a friend who’s a coffee connoisseur, one of these would be a perfect New Year Gift as well. As we said earlier, pour over coffee is one of the many techniques that is used to brew coffee. This is quite a lot different from traditional drip coffee or the easy-to-use Keurig coffee machines. The dripper, filter and the coffee grounds are the main components of a system. You basically have to put the ground coffee in the filter, pour hot water from the top and let the dripper do the job. As you can see, every step here is of huge importance. Even the slightest changes can alter the end-taste of your coffee. While that’s a nightmare for beginner brewers, that’s what forced me to make a shift. Personally speaking, I shifted to pour over coffee when I needed more control over the taste, brewing process and the whole feel of the drink. So far, I’ve not regretted that decision. Today, I’d prefer a poured-over coffee to anything else. Not because Keurig or Ninja aren’t good — but just because pour-over coffee makers offer so much freedom. As it happens, not all pour over coffee makers are made the same. So, you have to consider a few factors if you need an awesome pour over coffee. Let’s admit the facts here: pour over coffee makers aren’t for beginners. We recommend shifting to this type of brewers only after you have tried the instant ones. The point is that you should have a clear idea of the brewing process. Without understanding the ideal temperature, a proper amount of ground coffee and your own taste, you can’t get the best pour over coffee. There are two types of pour over coffee makers based on the filter. The first type comes with non-reusable paper filters. The second type comes with reusable filters that are made of stainless steel or other materials. I personally recommend drippers with stainless steel filters, because it won’t affect the taste. You are likely to preserve the coffee aroma as well. Serving capability of the pour over coffee makers also matters in the long run, you know. Some products do come with an in-built carafe, which can store up to six or eight cups of coffee. It’d be great if you can get one of those makers so that you can serve the coffee right away. I personally use one of those coffee makers — yes, with huge capacity, you guessed it. One thing about pour over coffee makers is that you can find them in almost every budget bracket. You can easily choose the product based on how much you can spend. Of course, there may be changes in terms of overall quality and control. That’s all about pour over coffee makers, folks. I know, we haven’t gone deep here, but the products we’ve listed are just awesome. I’ve been making pour-over coffee for a few years and I think I’ve still not mastered the art of it. So, what I’m saying is, you have a lot of time to get started and learn the art. But, make sure you get the best pick from here. Do you want better control over brewing and taste of your coffee? Check out our pour over coffee maker reviews before you choose one of these machines.